Feed Me, the Deadmau5 padawan, recently released a brand spanking new EP on Mau5trap called Feed Me's Escape From Electric Mountain. There's at least three great tracks on this EP, but Whiskers has to be my new favorite Feed Me track, claiming the no. 1 position from "Cloudburn" from the album Feed Me's Big Adventure from early 2011. Besides this monster track, I have to mention the mega-banger One Click Headshot and the mesmerizing house track Trichitillomania, which reminds me a bit of "Flat beat" from Mr. Oizo (gotta love head bopping Flat Eric). 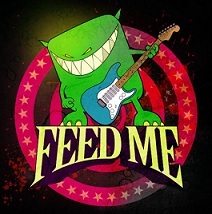 Feed Me is a pretty productive guy, he released both the before mentioned album around new years 2010/2011, he remixed Innocence by Nero and Robyn's Call Your Girlfriend and later that year, summer 2011, he released the 4-track EP To The Stars, with great tracks like Pink Lady and Chain Smoker. Before this, he's remixed single from Gorillaz, Chase & Status and Muse, all available on his Soundcloud. Even though Jon Gooch (aka Feed Me aka Spor) is British by origin, his sound is very American, and right in hot spot between Skrillex, Deadmau5 and Knife Party, drawing on the aggressive and glitchy sound from Skrillex, the melodic and hypnotizing riffs from Jedi master Deadmau5 and the details and eargasmic buildups from Knife Party.